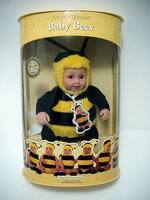 his Anne Geddes ‘Signature Collection’ Baby Bee is based on the captivating images from Anne's bestseller book "Down in the Garden". We know that you will treasure this beautifully crafted Baby Bee and delight in the enchanting magic that is to be found in all of Anne's work". approximately 10"